Back in school and getting back to normal? We had soccer games all day yesterday, almost two hours away from home and I do have to admit that it does make me miss our carefree beach days of summer. Are you back full force? Sports? Activities? What keeps you fast paced in school season? Homework itself can be a chore! Let’s see some favorites from last week. I have to start with a beauty! Design Dreams By Anne picked up a GORGEOUS old door at a yard sale for $5.00!!! Then she took it and made it into an awesome headboard! Check out this pretty! And not to wear old doors into the ground but VINTAGE MELLIE made a gorgeous outdoor getaway with hers! See how close she got to her “Pinspiration”. Showed her hubby and he did this in about an hour! 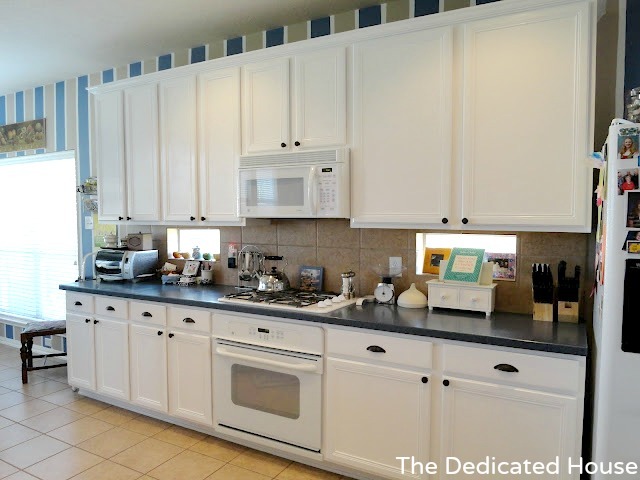 One of these days I will be brave enough to paint my kitchen cabinets but until then…..I will live vicariously through gifted women like “The Dedicated House”. Look at her kitchen cabinet make-over!!! You have to see the before! Let’s see what you guys are up to this week! Let me know what keeps you at a super fast pace during school season as well! Donâ€™t forget to link up at these other great Monday parties after hanging out here! Only rules to this party! * Say hey to the two links upâ€™s before yours (Share the love and tell them you saw them here!) We all love comments and meeting new friends. And that is it my friends! Link up! What great features! Thanks so much for hosting! Glad to link up! Thanks so much for the fun party…I hope you have a wonderful week! Thanks so much for hosting, Reb!